The genus Heliamphora contains the oldest and most simple carnivorous plants. These Sun pitchers plants are found in Venezuela and Brazil in South America where they grow in areas with Table Mountains. The carnivorous plant species such as Heliamphora heterodoxa, Heliamphora ionasi, Heliamphora tatei, Heliamphora minor and Heliamphora nutans occur only in these mountains. The larger species of this carnivorous plant are Heliamphora ionasii and Heliamphora tatei var. tatei and these exotic pitchers grow to be up to 50 centimetres in height. Heliamphora tatei produces stems that can grow up to 1 metre high. Various species of the Heliamphora are not often cultivated and it takes some practice to keep these plants healthy and living. 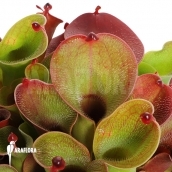 For additional information about the cultivation and care of this carnivorous plant as well as the exotic plants Araflora is offering in this category, please find below Araflora productinfo and Araflora plantcare sheets. Heliamphora species: Heliamphora arenicola, Heliamphora ceracea, Heliamphora chimantensis, Heliamphora ciliata, Heliamphora collina, Heliamphora elongata, Heliamphora exappendiculata, Heliamphora folliculata, Heliamphora glabra, Heliamphora heterodoxa, Heliamphora hispida, Heliamphora huberi, Heliamphora ionasii, Heliamphora minor, Heliamphora neblinae "Avispa", Heliamphora nutans, Heliamphora parva, Heliamphora pulchella, Heliamphora purpurascens, Heliamphora sarracenioides, Heliamphora tatei, Heliamphora macdonaldae and Heliamphora uncinata.